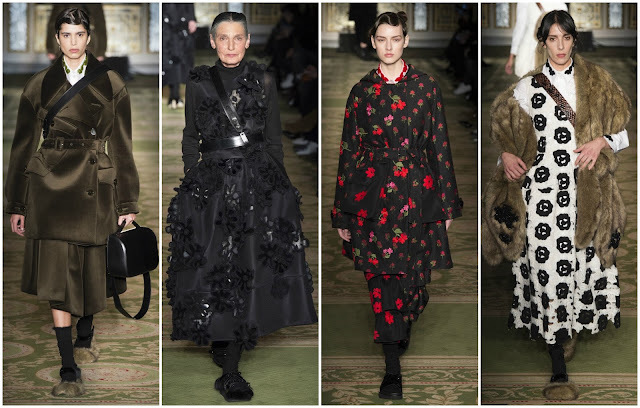 Something that delighted at London Fashion Week in February was Simone Rocha’s insistence on celebrating women of all different ages. The Irish designer has the fashion industry swooning with each of her poetically-inclined, trend-resistant collections. For Fall 2017 she wanted to reflect her customer base, the women that shop in her flagship stores in London (on the tony Mount Street) and New York (in the calm, urban enclaves of Wooster Street in Soho) or in an array of international stockists. The age range on her runway was 17 upwards to 73. There was 29-year-old Alana Zimmer, 33-year-old Jamie Bochert, 50 year-old Cecilia Chancellor, 53-year-old Marie-Sophie Wilson, 73-year-old Benedetta Barzini. But what does it mean? Is it pitiable attention-seeking or is it remarkably profound? One leans towards the latter as Rocha has never been a designer caught up in the social media maelstrom that other brands find themselves lost in. Her casting was suggestive of her customer base, what they might want to see. Motherhood has been a recurring theme in Rocha’s shows of late and no doubt she caters to many mothers, grandmothers. The ageless quality to her clothing is undeniable; this age-positive effort affirms it. These were the Simone Rocha women: younger, older, everything in between. The noteworthy casting isn’t to say they were compensating for the clothes, which simply weren't dull sales propositions. They extended the narrative that pervaded the past three seasons: ideas of blossoming, sensory experiences, the contrasts between masculinity and femininity, militaristic codes. In uncertain times, designers have resorted to sticking to their guns: certainty is sought after. Somehow, despite the past two collections’ tendency to refer to the one prior to the last and subtly implement new references, one can’t help but be whisked away by her spellbinding poetry. The artfully-inclined silhouettes and patterns are truly breathtaking. Perhaps the reaction is rooted in the designer’s honesty—Rocha is quoted in Tania Fares’ tome London Uprising, “when I’m designing, it has to mean something to me, otherwise, it’s just clothes. That’s always the joy of it, when things come together, and it means something so personal to me.” Furthermore, Rocha’s decision to extend the previous seasons symbolises stability in her business. Her distinct design handwriting has finally hit its stride: it’s consistent, plays upon traditional gender boundaries and is defined by an exquisite poetic language that is accessible and sincere. Bonded velvet biker jackets in khaki, twee smocked dresses in pearly white, embellished wrap dresses (to this critic, they expressed the notion of messiness, the tenet of motherhood explored two seasons ago) and embroidered tulle dresses took the runway at Lancaster House, the neoclassical mansion in St James where Rocha has presented for some time. The old-world glamour of a poppy-printed tulle dress was emphasised by the fur shawl that accompanied the look. It bridged the gap between young and old, it was as if the model was wearing her grandmother’s shawl. Age is relative, youth a mindset—Rocha proved that with this smashing effort. She is London’s finest.